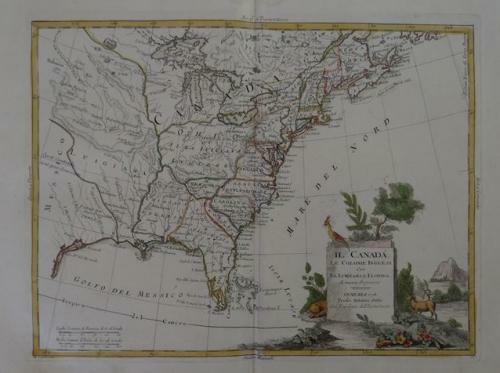 Title: ''Il Canadá le Colonie Inglesi con la Luigianan e Florida di nuova Projezione" by Antonio Zatta (1757-1797) Venice 1778 taken from "Atlante Novissimo"
A very elegant map that shows the east coast of the USA and Canada (to Newfoundland) that includes many curiosities, including Florida in the shape of an Archipelago, a very narrow Georgia, with a massive Florida or Appalachesia shown to the southwest. This is also one of the earliest and largest treatments of Ohio (called Ohio or Upper English Louisiana), which reaches from Pennsylvania to the Mississippi River and south to Cherachesia (modern Tennessee). Florida coves a large amount of Alabama and Georgia and is altenatively named Apalachesia. There are many early forts and Indian Tribes. A fascinating atlas map of the United States issued at the start of the American Revolution. Very good condition with only some minor margin toning (well away from the printed area).